This edition offers a compact portrait, in peace and in war, of the ancient Roman army, one of history’s most famous and successful military organizations. Twelve literary passages combine with nine epigraphic and other documents to show soldiers who don’t merely fight: Between battles, they march, drill, camp, construct public works, eat, drink, and—sometimes illegally—marry and have children. At times, and invariably with bloodstained results, troops also involved themselves in Roman politics. With selections from a variety of sources and a time span ranging from the First Punic War to the reign of M. Aurelius, this compact reader is like no other currently available. In a welcome change for the Bolchazy-Carducci Latin Readers series, Dexter Hoyos provides their first Latin reader that focuses on a theme rather than an author or a genre.1 This well-balanced book introduces students to the history of the institutions and the people of the Roman military community through a number of carefully selected ancient sources in Latin. Hoyos has successfully marshalled passages from literary prose, satiric verse, and epigraphic and papyrological documents, representing not only traditional elite male authors, but also emperors, common soldiers, and women. The selections are further bolstered by a commentary appropriate for the series’ intended audience of intermediate and advanced Latin students. While additional auxilia will be necessary for those interested in generic or literary conventions, Hoyos’ Roman Army Reader nevertheless fills a need for a more social and institutional historical approach to Latin instruction. Besides traditional Latin students, Roman army enthusiasts will also find the selection and commentary to be both informative and rewarding. Hoyos’ selections are meant to illustrate the “true range” of the Roman army beyond the narrow image of the Caesarian or Trajanic army on the march, and they aim to “depict the army in war and at peace, collectively and individually, sometimes at war with itself” (xi). The passages are organized into five sections that focus on different themes: individual soldiers’ careers, “peacetime” activities, training and the order of battle, praetorian coups d'état, and battle narratives. The total is about 850 lines or 36 pages of Latin text, with twelve literary passages,2 eight selections from sixteen inscriptions,3 and the famous birthday invitation of Claudia Severa, preserved on a wooden tablet from Vindolanda.4 The texts are generally organized chronologically within each section and cover topics that range from the organization of the fourth-century BCE legion as reported by Livy, to Vegetius’ late fourth-century CE description of sword-training in the imperial army. 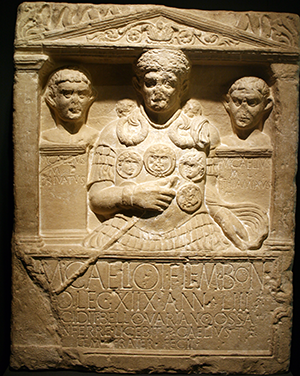 The selection of inscriptions and the tablet is excellent and represents a variety of text types (epitaphs, dedications, letters, and speeches) as well as people (generals, officers, centurions, legionaries, auxiliaries, infantry, cavalry, and women). The book also includes a preface, a thirty-six page historical introduction, a list of suggested secondary readings, a commentary, appendices (original texts of the inscriptions and the tablet, a chronological table of events, and a list of emperors to 235 CE), a map of the Roman Empire, illustrations of some of the inscriptions and the tablet, and a complete vocabulary (with a list of the abbreviations for Roman praenomina).5 Additional illustrations can be found on the publisher’s website. In his introduction, Hoyos provides sufficient background information on the Roman army without overwhelming the reader with too many technical details. He focuses largely on the historical changes in the size, structure, organization, recruitment, hierarchy, weapons, and battle style of the Roman army from the early Republic to Marcus Aurelius. Much of this information is necessary, especially when reading the passages from the career inscriptions (selections 2-6) or Hadrian’s speech to cavalry units (selection 13). Greek sources, especially Polybius and Josephus, are discussed in detail, as are some of the potential problems of determining the structure of the early Roman army. Little mention is made of the daily life of soldiers or of the contributions from archaeology (beyond the discovery of new texts). While Hoyos acknowledges the expansionist policies of a number of emperors, he supports the traditional view that the overall purpose of the Roman imperial army was “mostly to maintain the status quo and resist outside pressures” (xxxix). Hoyos occasionally discusses the controversial idea of “Romanization” and the equally controversial idea that the Roman army was an agent in this process (xli and 143), yet he does not provide a clear definition of this important term. Does he consider “Romanization” a change in habits and values reflecting contact with the institutions of the Roman state that led to the creation of a new Roman imperial culture? Or does he mean the more aggressive sense of the imposition of “civilization” on “barbarians”?6 Since this book may be a student’s first real encounter with the sources for the history of the Roman army, I believe that a fuller discussion of “Romanization” was warranted. In addition, the introductions offers no close discussion of the authors, genres or specific historical and literary contexts from which his selections derive. Rather, when the selections are mentioned at all in the introduction, they are usually used to illustrate an historical point about the development of the Roman army. The commentary is by far the best part of this book. In general, the notes appropriately aid the intermediate-level student in reading the Latin and understanding the text. 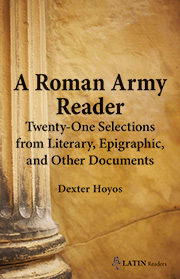 Hoyos introduces each entry with a brief assessment of the selection’s historical or narrative context, usually indicating how the passage contributes to our knowledge of the development of the Roman army. Inscriptions and the tablet are given a physical description, a findspot, a date, and often a photo, and at times Hoyos refers to typological conventions, such as the arrangement of military positions in career inscriptions. While many notes focus on historical points related to the Roman army, much of the commentary is devoted to elucidating aspects of grammar, the narrative or historical context, idioms, and some stylistic points, especially for Tacitus. Translations are provided only for ambiguous vocabulary, technical terms, or where a literal English translation might prove awkward. At times a final note previews what comes next in the source. For a book aimed at the intermediate Latin student, however, Hoyos surprisingly assumes that his audience has a great deal of background knowledge about Cicero, Caesar, Livy, and Tacitus. He provides more background information for the authors less typically assigned in beginning Latin courses, but more on the major authors would have been helpful.7 The commentary is also short on discussion of genre or literary conventions. For example, the notes on the selection from Juvenal’s Satires appropriately address points grammar, legal language, and historical context, but a more thorough discussion of meter and genre would not have been out of place. The teacher should be prepared to provide additional guidance to students unfamiliar with the generic or stylistic conventions of the selected authors. While I am sympathetic to Hoyos’ focus on these texts as historical sources, I believe that an intermediate reader, even a thematic one, needs to provide information necessary to appreciate the literary background of the selections, in addition to how they contribute to our understanding of Roman history. This book will appeal to a range of audiences.8 First, the Roman army enthusiast with a background in Latin is likely to enjoy this book, which complements Campbell’s well-known sourcebooks of translated texts.9 For the intermediate Latin student, perhaps in a third- or fourth-semester college course, this reader offers a nice diversity of text types (prose and poetry, different authors, different periods) on a clearly circumscribed theme that could easily be expanded upon, perhaps with readings from Augustus’ Res Gestae or Virgil’s Aeneid. For an upper-level course on the Roman army, I might assign this text first, then have students read extended selections from Caesar, Tacitus, or even epic poetry, and then compare these to visual depictions of the Roman army. Or, using Hoyos’ commentaries as a model, students could write their own commentaries on short texts easily available on epigraphic and papyrological databases. Hoyos’ Latin reader, like many others in this series, offers the instructor the flexibility to use the book in a variety of courses. 1. Another thematic reader from the Bolchazy-Carducci Latin Readers series is scheduled for publication in 2014: Sheila K. Dickison and Judith P. Hallett, A Roman Women Reader: Selections from the Second Century BCE to the Second Century CE. ISBN 9780865166622. 2. Three from Livy Ab Urbe Condita 42.34-35.1; 8.8.2-14; 22.4-6; two from Tacitus Annals 1.16-17, 28; 14.37-39; and one each from Tacitus Histories 1.40-41; Juvenal Satires 16.7-34; Vegetius De Re Militari 1.12, 3.13-14; Suetonius Gaius 57-59 and Claudius 10; Cato Origines 4, frg. 83 (= Gellius, Noctes Atticae 3.7); Cicero Ad Atticum 5.20.3-4; Caesar Bellum Civile 3.90-96, 98-99. 3. The texts provided for the inscriptions and the tablet in the main section of the book are normalized: abbreviations are expanded, editorial emendations and additions are generally accepted, and, at times, line numbers are altered for easier reading. The original texts of the inscriptions and the tablet are provided in appendix A, with full editorial markup (except for underdots), so that students or instructors can compare the two. The texts include: ILS 2244 (9 CE); ILS 2683 (early I CE); ILS 9200 (late I CE); JRS 60 (1970) pp. 142-153 = AE 1969/70, 583 (early II CE); AE 1956, 124 (ca. 183 CE); E. Mary Smallwood, Documents Illustrating the Reigns of Nerva, Trajan, and Hadrian (Cambridge, 1966), 321d-e, g, i, 322, 323b, 324-5 (all from Hadrian’s Wall; each of these inscriptions is one line, except for 324, which is three lines; early-mid II CE); ILS 9134 and 2487 (128 CE); CIL 3.13439 (179 CE). 4. T.Vindol. 291 (ca. 100/105 CE), available online at Vindolanda Tablets Online. 5. As often in this series, the suggested reading list is limited to books in English. Most of these focus on the Roman army. No articles are mentioned, and very little scholarship on the literary sources is listed, nor is a general work on epigraphy. A number of places mentioned in the text are missing from the map, including Vindolanda, Baalbek, Beirut, and Venice. 6. Hoyos seems to offer a definition for “Romanization,” without explicitly saying so, here: “Although the first Roman soldiers were citizens living in and around the City itself, the army’s range of recruitment steadily widened as the empire grew, until legionaries represented all the peoples who had become ciues Romani and no less numerous were the auxilia of provincial non-citizens. The spread of Roman culture and the Latin language, and their enduring impact on Europe, was due in great measure to the settled presence of the legions over so many centuries” (xiii-xiv). 7. No major errors were detected in the notes, although the note on manu 2 in line 11 of selection 8 (T.Vindol. 291) is incorrect: manu 2 indicates Severa’s own hand for lines 11-14, while the majority of the letter, including manu 1 in lines 15-17, is the hand of the scribe. 8. I doubt that the average college Latin student would appreciate this comparison on page 68: “Maximianus was clearly an outstanding cavalry commander, like Napoleon’s Marshal Murat and the American South’s J. E. B. Stuart.” Then again, perhaps this is an opportunity to explore other periods in military history. 9. Brian Campbell, The Roman Army, 31 BC-AD 337: A Sourcebook (London and New York: Routledge, 1994) and Greek and Roman Military Writers: Selected Readings (London and New York: Routledge, 2004). 10. I would like to thank Deborah Pennell Ross and Josiah Osgood for their insightful comments. Roman Army Reader, supplementary online illustrations, four additional illustrations to enhance the printed text. Page 60 - Fig. A. Stele of Ti. Claudius Maximus. Found at Philippi in northern Greece in 1965. Maximus had it inscribed and set up during his lifetime. Reproduced by kind permission of Prof. Speidel. Compare Fig. 2, Arch of Trajan relief: Suicide of Decebalus, printed in A Roman Army Reader. Wikimedia Commons. Page 110 - Fig. B. “Proclaiming Claudius Emperor” (1867). Sir Lawrence Alma-Tadema depicted many Roman scenes, trying to be as faithful to known evidence as possible. 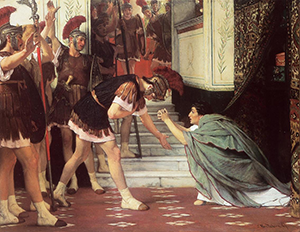 The irony of Claudius begging for his life while at the same time the praetorian soldier Gratus bows to him is vividly portrayed, although Claudius looks much younger than a fifty-year-old. Wikimedia Commons. Page 110 - Fig. C. Aureus of Claudius. 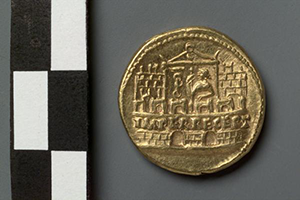 Acclaimed emperor by the Praetorian Guard after his nephew Gaius “Caligula” was assassinated in January, 41 CE, Claudius soon afterwards had gold coins struck, displaying his bust on one side and on the other side the main gate of the praetorian camp, with a soldier holding a military standard. Across the base of the image are the words IMPER RECEPT (imperio recepto, ablative absolute): Claudius openly advertised that he owed power and the empire to the guardsmen. Perseus 4.0 (the Perseus Hopper). Page 134 - Fig. 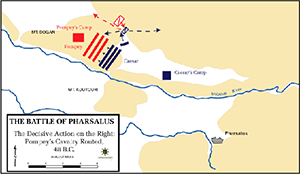 D. Diagram of the Battle of Pharsalus (9 August, 48 BCE). Wikimedia Commons.